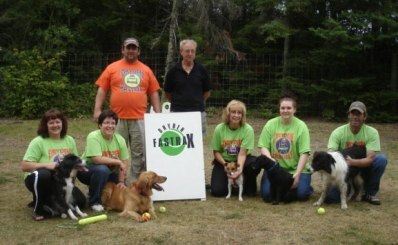 The Dryden Fastrax flyball team was started in the early 90's and was taken over by Bonnie Paterson in 2006. We started with 4 dogs and 4 handlers and trained once a week. Once all dogs were trained we took off to our first Flyball tournament in Winnipeg Manitoba. Since then our club has grown into a successful team, full of energetic handlers and dogs. We enjoy traveling to Manitoba several times a year to attend tournaments, earning points and titles for our dogs. We believe in racing together as a team and pride ourselves on our hard work and fellowship. We are registered in region 8 with Saskatchewan and Manitoba teams and are looking forward to, hopefully, attending our first tournament in Saskatchewan this summer.